Nokia is certainly will launch the Lumia 928 at its press event scheduled for May 14, but according to the latest reports it might be joined by another high-end smartphone on stage. 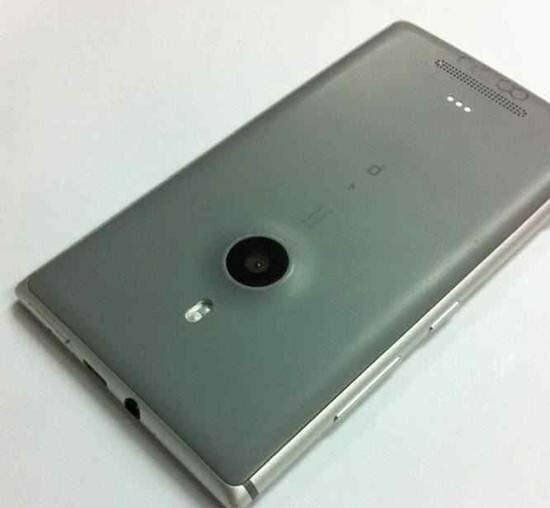 The Nokia Lumia 925, is a full metal-body smartphone, which was previously known as Catwalk, it’s rumored to pack a 4.5-inch display (1280 x 768 pixels) of resolution. The device is said to feature a Snapdragon S4 chipset with a dual-core Krait processor clocked at 1.5 GHz, a 1 GB of RAM, 8.7 megapixel main camera with f/2.0 aperture as well as 16 GB of inbuilt memory and a 2,000mAh battery. 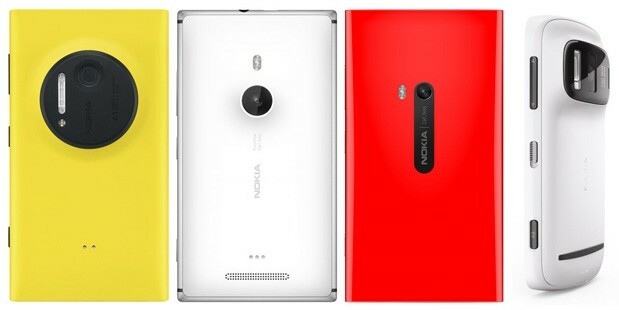 The Nokia Lumia 928 might also feature a new design, but the model is said to be exclusive for Verizon. As you might know, Nokia has already put up an official teaser pages for its Lumia 928 flagship smartphone and the device had appeared on few billboards. To know all about, make sure to join us! when Nokia will hold its event. Apple, Google, Microsoft and BlackBerry bear down for the great mobile enterprise race in 2013. 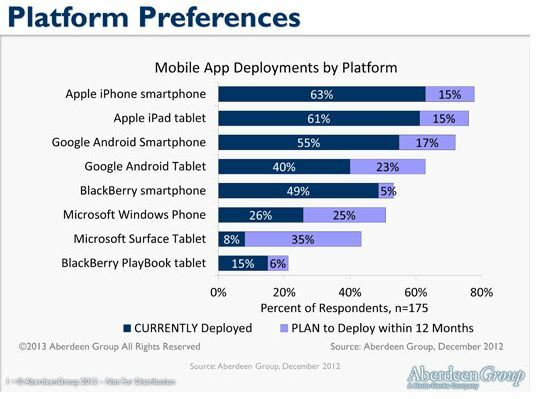 Here are the results from an exclusive survey on mobile app deployment plans for all mobile platforms. The winners and losers may surprise you. In a survey done by the Aberdeen Group, some 348 enterprise application developers were asked which mobile platforms they’ve released or were planning on releasing their products to. While iOS and Android were unsurprisingly at the top of the chart, Microsoft’s mobile OS’s saw some great responses by developers, with the Windows Phone and Surface Tablet having 25% and 35%, respectively, of developers planning on releasing apps within the next 12 months. Aberdeen ties this rise with the growing emergence of Bring Your Own Device (BYOD) in the corporate world. Samsung has been heavily promoting that campaign hoping that it will help boost the sales of devices like the Galaxy Note II. Of the total surveyed 348 organizations, 35 percent of respondents are planning to develop apps on the Surface tablet/Windows 8 over the next 12 months and 25 percent planning to develop apps on Windows Phone. If notice the above chart, both the Microsoft platforms are on top of the chart in CIOs list. In light of what looks like a bright future for Microsoft, the news is not so good for BlackBerry. Despite the release of the BlackBerry 10 OS, businesses have all but lost faith in the Canadian company, due to their oft-delayed operating system, and unclear plans for the future, especially in regard to its PlayBook tablet. Windows Phone might be a promising platform with great looks and plenty of fluidity, but sadly with no official sales figures it’s hard to know whether it’s catching up or not. Frank X. Shaw, Corporate Vice President of Corporate Communications at Microsoft, has cited a report by the IDC stating that Windows Phone has managed to outsell the iPhone in 7 markets and Blackberry in a whopping 26. Sadly, he didn’t disclose where exactly Microsoft has managed to get in front of Apple and Blackberry, but it does sound very promising for the company’s mobile OS. Shaw also mentioned that Windows Phone now touts a 10% smartphone share in many markets, an aim that the Redmond top dogs set back at the OS announcement a few years back. 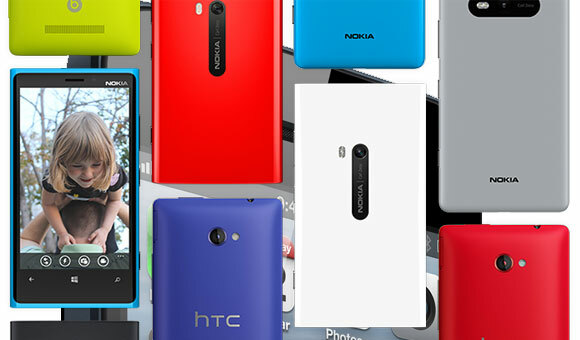 However, we are clueless just how successful the WP smartphones are without actual numbers. Nevertheless, Shaw said there’ll be more information regarding the reach of Windows Phone, as well as the cool new features that Microsoft prepares for the platform at the annual Build developer conference. That will take place on June 26 through 28. Posted in: Windows Phone. Tagged: 805a0193, App Store, AppStore, download issues, error code, error code 805a0193, ErrorCode, Marketplace, Microsoft, minipost, mobilepostcross, mobilepostmini, users unable to download apps, Windows Phone, Windows Phone Store, WindowsPhone, WindowsPhone 8. 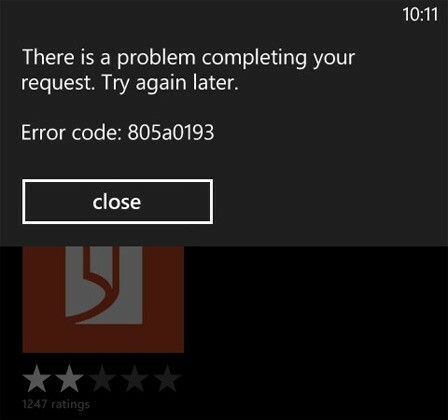 Recently Windows Phone users seems to be unable to download apps for the time being. 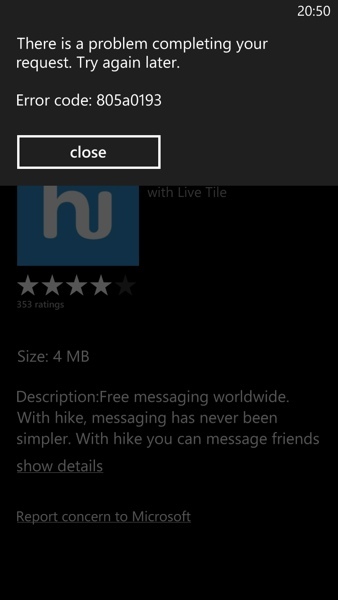 The Windows Phone Store is having technical issues, which is preventing the download of new apps. Users trying to download or update apps are being shown the above error message, with the error code: 805a0193. The issue seems to be widespread and we have confirmed it on our own device as well. No word yet on what’s causing the issue but hopefully it should be sorted soon.